Bajaj Auto have been steadily making some good effort to stay in track of India auto world. And now the Pulsar 200 SS which was earlier showcased at Auto Shows is now getting ready to make its way to the Indian Roads soon. There have been a lot of photos making its way to the Internet about the Completely assembled Pulsar 200 SS. Now we have official news about it. The price range of Pulsar will around Rs. 1 lakh and the expected launch will be around April First week. 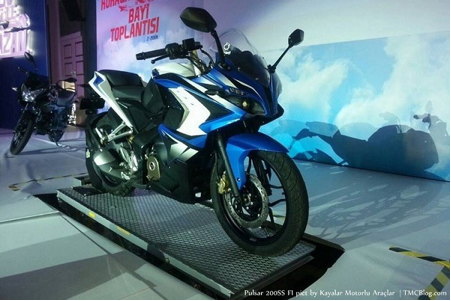 The Pulsar 200 SS gets its Tank and its heart from Pulsar 200 NS. The Pulsar 200 SS will be powered by a 199.5 cc Single cylinder, 4 Stroke engine which develops 23 PS of Power and 18.3 Nm of torque. Pulsar 200 SS has a six speed transmission. The Pulsar 200 NS have received a warm welcome from bike Enthusiasts and would this continue for Pulsar 200 SS ?? Let us wait and See. We would soon post a comparison Pulsar 200 NS vs Pulsar 200 SS. The Pulsar 200 SS has to compete with Duke RC200, Yamaha R15 and HX250 R from Hero. Keep yourself updated by subscribing to our news feed.